When atoms form molecules, they share their outer electrons and this creates a negatively charged cloud. Here, electrons buzz around between the two positively charged nuclei, making it impossible to tell which nucleus they belong to. They are delocalized. But is this also true for the electrons located closer to the nucleus? And are those electrons spread out too, or do they belong to just one nucleus, i.e. are they localized? These questions, that scientists have hotly disputed over the last 50 years, have now been answered by an international team of scientists, led by Frankfurt University’s atomic physics group. Their discoveries are reconciliatory. As is so often the case in quantum theory, there is no single ‘right’ answer – one solution is just as valid as the other. In order to answer these questions, the scientists first removed the innermost electron located close to the nucleus from nitrogen molecules (N2), using high-energy light from a synchrotron radiation source at the Advanced Light Source at the Lawrence Berkeley National Laboratory, Berkeley, California. It is reasonable to assume that these photo-electrons belong to one nucleus and can thus be located. They leave behind a vacancy in the inner core shell, which is then filled by an outer electron. Additionally a second electron (an Auger electron) is ejected from the molecule. This Auger electron acts as a probe that can determine exactly where the original hole was created. Both electrons, the photo-electron and the Auger electron, form an entangled state, which means that as soon as one is measured, the properties of the second are determined as well. This prediction of quantum theory - which was rejected by Einstein as a “spooky long-range interaction” - has since been found to be valid for twin photons. It is the basic scheme behind quantum cryptography as well as “Quantum teleportation”. Professor Reinhardt Dörner’s group is the first to prove the existence of such entangled states for electrons, using the COLTRIMS technology, which has been developed in Frankfurt over the last decade. 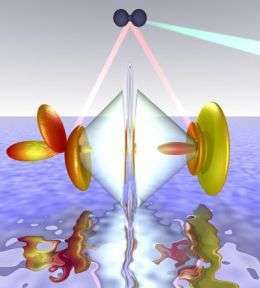 With this experimental set-up, they are able to reveal the pathways of the two electrons created. In the current issue of the highly prestigious Science magazine, the physicists claim that the question of whether an electron is localized or not can only be answered for the complete system. If the innermost electron is localized, the second electron can be assigned to either of the two nuclei. But sometimes it proves impossible to determine whether the first electron originates from the left or the right 'atom of the first electron. In this case the second electron is also delocalized. With these experimental details, it is now possible to explain the observations of the last 50 years in a unified model. Both groups - those supporting the localized theory and those endorsing a delocalized picture - are thus reconciled. Dr. Markus Schöffler, who is responsible for the measurement, sees further exciting perspectives opening up and he plans to continue his work on this topic in Berkeley, funded by a scholarship from the Alexander von Humboldt Foundation.